Welcome to the Portal-Rodeo Seed Library. This is a project geared to save and share seeds for both edible and non-edible plants. Our seed library is generously hosted at the Myrtle Kraft Library in Portal, AZ. Our meetings are open to anyone who is interested, and anyone may be a member. There is no cost to participate in the seed library. In general, we hope that people will contribute roughly as much as they borrow, but this can be done over time, as long as our supplies hold out! There will be an optional donation jar for those who want to contribute. These funds will be used for seed library supplies, books, etc. If you are interested and haven’t gotten on the email list for this project, contact Karen at karen at k12opened dot com. Save seeds from your healthiest plants. Don’t save seeds from hybrids. Reduce cross-pollination when possible. Dry seeds completely. 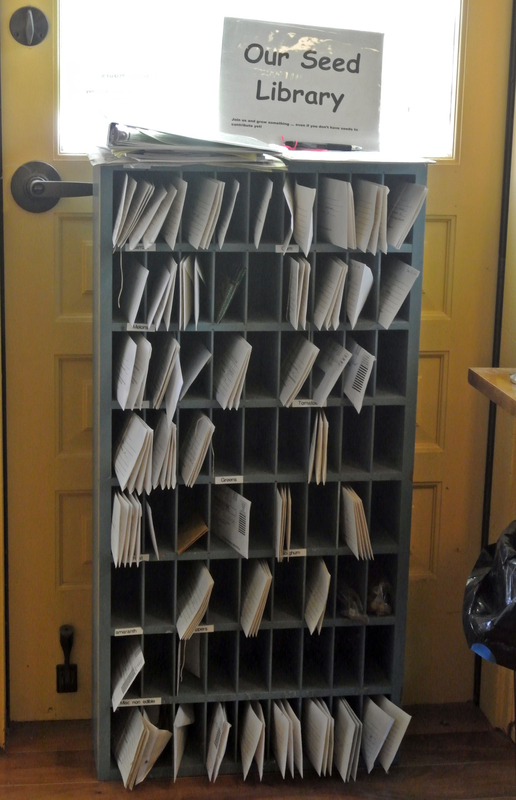 Put approximately 30 seeds in a seed library envelope and fill out the pertinent information. Log the seeds you contribute into the binder. Become a member by signing our membership list. Choose your seeds (1 envelope per person per type of plant until we see how much demand there is). Please don’t take more than you plan to actually grow. Sign seeds out in the binder. Return some to the library if you can.